July had many great things going on: our team sailed over to San Diego Comic-Con to take part in a special panel with Sea of Thieves superfan Freddie Prinze Jr, we dropped The Sunken Curse Bilge Rat Adventure, and of course our free Cursed Sails content update was unleashed upon the Sea of Thieves. 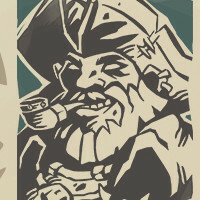 However, Sea of Thieves creators may remember that we also asked our community to get involved in our Shark Week Challenge. The winners of this would take home loot in the form of a Sea of Thieves Limited Edition Xbox Wireless Controller, The Hungering Deep Unisex T-shirt and 40 Bilge Rat Doubloons, while the runners-up would bag themselves a T-shirt and 40 Bilge Rat Doubloons! And like sharks to some tasty chum, you came out in droves! We hunkered down in our tavern and in true shark style sunk our teeth into all the submissions we received. After hours of deliberation, laughter and one or two jump scare-related incidents, we're pleased to say that we've found our winners! Alright! I Finished My Commen... OH DEAR GOD! A big thank you to everyone who entered! The competition was as fierce as the Hungering One itself.